Lies are sometimes best dealt with like a Band-Aid that must come off. So brace yourself, this may sting a little. YOU are not an angel - and you never will be. I don’t care what your momma says about you – you aren’t an angel! You are a human. Brace yourself again! There is more! Those we love who die do not become angels, even if they do go to Heaven. They remain human. You do have angels in Heaven watching over you, that is true, but they aren’t them! Those that were born human never become angels. The thought that we become angels when we die is not so much a Bible misquote, since it doesn’t tie back to a certain passage or verse that is misunderstood. It’s simply a lie that’s been quoted, sloganized, and believed by many Christians. But don’t let the demise of your hopes to sprout wings and fly around Heaven with a harp bring you down! You were made in the image of God, and angels were not. Genesis 1:26-27 says that He made us in “Our Image, according to Our Likeness”, referring to the Godhead as “Our”, which is God, Jesus, and Holy Spirit. We resemble God as we were made in His likeness. In Revelation 22:8-9 we read of John’s experience in seeing the angel who showed him Heaven, and things yet to come. 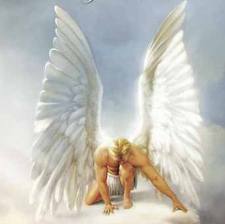 As John started to bow to the Angel, the Angel spoke to him and said, “See that you do not do that. For I am your fellow servant, and of your brethren the prophets, and of those who keep the words of this book. Worship God.” They serve God just as we should, and they worship God just as we should. They worship Jesus as well, as we read in Revelation 5:11-12 that John heard the voice of many angels sitting around the throne singing, “Worthy is the Lamb who was slain”. It was important that they be created before us because we are their ministry. Hebrews 1:13-14 says “Are they not all ministering spirits sent forth to minister for those who will inherit salvation?” Only humans, those for whom Jesus was also made “a little lower than the angels” (Hebrews 2:9), and died for, can inherit salvation. We are the apple of God’s eye (Deut. 32:9-11), and only we receive this favor of grace. Not all Angels are heavenly and good. Angels were given free will just as we were, and they answer to God for their mistakes. Yet they were not given a plan of redemption as we were through Jesus Christ. When they sin, they are cast out of Heaven. Ezekiel 28:12-19 describes Satan as being “the seal of perfection, full of wisdom and perfect in beauty”. He was covered in beautiful stones, able to walk through fire, with timbrels and pipes made for beautiful worship sounds. But in all his glory, he sinned and became full of pride and attempted to equal himself to God. Verse 15 says “You were perfect in your ways from the day you were created, till iniquity was found in you. By the abundance of your trading you became filled with violence within, and you sinned; therefore I cast you as a profane thing out of the mountain of God”. And where did he go when God cast him out? He did not go to Hell, he came to earth. Revelation 12:9 says “So the great dragon was cast out, that serpent of old, called the Devil and Satan, who deceives the whole world; he was cast to the earth, and his angels were cast out with him.” He continues to deceive us today, as he walks about us seeking who he can destroy, and who he can take with him on judgment day. He knows his time here is short, and now he makes war with us who are children of God (Revelation 12:17). While we are called the “Sons of Man”, he and his demons are called the “Sons of God”. Yet even today he and his demons must present themselves before God. They are still under the authority of Almighty God. Job 1:6 says, “Satan also came among them. And the Lord said to Satan, “From where do you come?” So Satan answered the Lord and said, “From going to and fro on the earth, and from walking back and forth on it.” But don’t let that worry you much! He also saw the hedge that God had put around Job, and he sees how far God will let him go with His children. Friends, knowing that we are granted more grace than the angels, we can be proud to be human. 1 Peter 2:9 says we are “a chosen generation, a royal priesthood, a holy nation, His own special people”. Had we been angels, our sins would have condemned us. We would be as the fallen angels, waiting for the day when Christ will descend from Heaven and take Satan and them to Hell, and lock them in. We are blessed to be given the chance to redeem ourselves, and I don’t mind that when I get to Heaven, I won’t sprout wings and fly around. In spite of myself, and through the shed blood of Christ, I will be there! I walk the golden streets, I will sing praise to Him, and I will see Him. Without His grace, none of that would be possible. I don't need wings. His grace is enough.